Special discounted package created for the the Jung & Sheldrake Webinar hosted by Gary S. Bobroff. Includes 4 presentations from the 2014 Synchronicity Symposium by Rupert Sheldrake and Gary S. Bobroff. Available for a limited time only! Synchronicity Symposium 2014: Somatic Attachment with Shannon O'Neill. Shannon will guide you into the dynamic realm of her Jungian and Body-centered practice, where we find that the soul of every human being is encoded with an image of desire. The ultimate symbolic aim of this desire is the joining of body and spirit. This divine/human inner marriage creates the wholeness that restores one to their nature. The reunion of Psyche and Soma is the healing function in disorder - both in the inner world and outer world. Healing is natural. All one needs is to be returned the their nature. The Jungian tradition explores and employs the vast resource of the image-rich landscape of Psyche. This imaginal world is the well-spring of all wisdom traditions, belief systems and spiritual disciplines. Somatic Attachment Therapy grounds this transcendent wealth in the body through regulation of one's neurophysiology: The body's transmission and reception system. Everything we need is there. Everything we need is here. Shannon O'Neill, MA, LPC, LCAS is a proud mother and private practice psychotherapist living in Asheville, NC. She is trained in the Archetypal Psychology tradition of Carl Jung and neurophysiology of Somatic Psychotherapy. Synchronicities are both gifts and challenges. They can be felt as acts of grace, or the subtle patternings of a cosmic artist, yet they can also suggest an elusive trickster who demands careful discernment both outer and inner. There seem to be stages that individuals go through in their deepening recognition of the synchronistic dimension of life. Synchronicities can compensate for the one-sidedness of egoic consciousness, and move the individual psyche toward wholeness. They also have, like all things, a shadow side. Most profoundly, they can give us intimations of the numinous. In our postmodern age when all the old metanarratives are contested, awareness of synchronicities has become for many alert individuals a crucial source of spiritual orientation and nourishment. Gary S. Bobroff, M.A., author of Crop Circles, Jung & the Reemergence of the Archetypal Feminine (Aug. 2014), presents a visual consideration of this mysterious phenomenon within the context of modern psychological reality. Looking at both the phenomenon itself, and the nature of the era into which it has arrived, he offers a framework for our own deeper consideration. Living in the moment of the death of one worldview and the birth of another, our culture suffers from an over-masculine inflation that has us alienated and imagining ourselves to be separate. Yet today, we are being presented with crises and mysteries that call us back toward closer participation with the world. Crop Circles—formed in living grain—exemplify the archetypal feminine nature of this moment’s change: a moral calling toward conscious, felt engagement with a dynamic, living mysterious world. Synchronicity Symposium 2014: An insightful panel featuring Stephen Aizenstat, Dr. Jim Tucker, Toko-pa, and Gary Bobroff and hosted by Bonnie Bright and Stephen Linsteadt on synchronicity and the unity of psyche and matter in the world. Humanity is fraught with perilous divisions that often follow lines of flawed ideologies and religious structures. Each and every one of us follows our own ‘reality tunnel’ that is custom made by our experiences. Experience is Gnosis in its most raw form and thusly, what we seek to learn will directly effect how we see the world. Gabriel will discuss the term Gnosis in its modern context and how it applies to us as individuals. Through a review of his book, The Quest For Gnosis, Gabriel will show how we may address the pitfalls of our ideologies while detailing how we might harness ancient wisdom as well as the latest of our discoveries in science to form a more expansive, pliable and welcoming cosmology. Gabriel will detail from life experience how these thoughts and processes have fleshed out to create a more honest review of his own strengths and failures, showing how we all might come to a more efficient manner of insight in our own exploration of the great mystery of life. 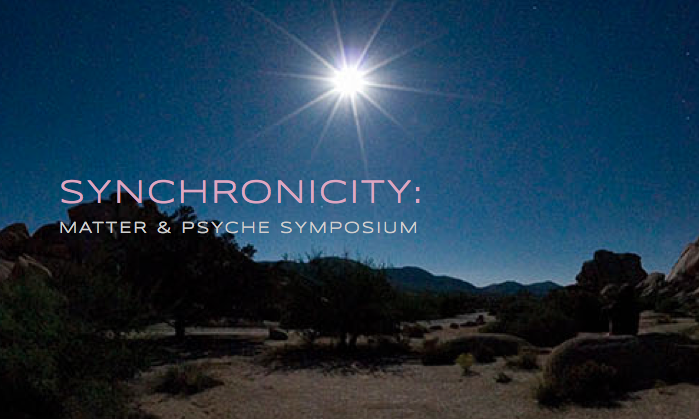 The SYNCHRONICITY: Matter & Psyche Symposium is a landmark coming together of visionary leaders whose work has pioneered our understanding of the unitary nature of reality. This year, and in the years ahead, join with us and leaders in the fields of extended mind research, consciousness studies, somatic and Jungian psychology, near death experience, quantum physics, synchronicity, yoga, tantra and more. Feast on deeply felt mystical experience, on passion for the earth, on science grounded in the heart!